Much of the navigable Monmouthshire and Brecon Canal flows through the stunning scenery of the Brecons National Park offering views of rugged green hillsides, dense woodlands and wild moors in a largely rural and tranquil setting. The canal towpath offers both walkers and cyclists a wonderful way to explore the area. Whilst the canal is not part of the main waterways network, there are several hire companies based here offering holiday makers the opportunity to cruise this beautiful waterway. The southern section of the canal, from Five Locks Cwmbran to Newport and the Crumlin Arm are actively being restored, with it's hoped, a new marina at Crindau, Newport, part of the proposals. This tourist map of the Monmouthshire and Brecon Canal and Crumlin Arm at 1:45,000, has detailed town plans of Brecon, Talybont-on-Usk and Gilwern at 1:12,500. The map includes navigation and historical information, visitor moorings, marinas and boatyards, boat hire centres, facilities for the boat user, shops, post offices and distance markers. Information for the tourist includes tourist information centres, places of interest, bicycle hire, canoe hire points, pubs, nature reserves, parks, churches, long distance paths, public toilets, hostels and caravan and camp sites. 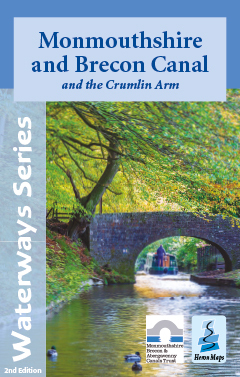 The Monmouthshire and Brecon Canal map is available to buy online or by telephone from our business partner, Guidepost. Click on the logo below to visit their store.